If you love Mexican food this Chipotle Chicken Burrito Bowl is a recipe you’ll want to try! It provides an amazing combination of flavors and an extra kick from the cilantro lime sauce for a healthy lunch or dinner! Have I mentioned that I love Mexican food?! Unfortunately, Mexican food and my focus on getting fit don’t go particularly well together, so I’ve been working on coming up with some options that are on the healthier side. This recipe for Chipotle Chicken Burrito Bowls is loosely inspired by Chipotle’s burrito bowls, however, this version is so full of flavor that I actually think it’s better! The bowl starts with my version of cilantro lime rice, then is topped with Spicy Mexican Chicken, seasoned black beans and some other deliciousness, including one of my favorite sauces. And yes, there is a lot of cilantro and lime in here, however, I promise it is not overwhelming! If you make the chicken ahead of time during your regular weekly meal prep, this makes a good quick option for a weeknight meal. If you’re making the chicken at the same time you make everything else, you’ll want to start it first, as it will need a little time to cool before you shred it. You can make the black beans while the rice is cooking. The cilantro lime sauce will likely turn out to be more than you need for this dish, however, I love it so much that I just save the extra for other things – tacos, quesadillas etc. I also find it easier to just use up the container of greek yogurt! Making Perfect Brown Rice, Every Time! When cooking brown rice you want to use long grain rice, which is what’s common in most grocery stores. It’s also one of many grains where I don’t recommend following the package directions, as you’ll likely end up with rather mushy rice. Instead use a ratio of 1 to 1.5, so for every cup of rice use 1 1/2 cups of water. Bring the rice and water to boil, cover and reduce heat to simmer, then cook for 25-35 minutes or until the water has just evaporated. The cooking time will vary slightly depending on how much rice you are making. Once the water has evaporated remove the pot from the heat and fluff the rice with a fork. Microplane Grater – This is an essential kitchen tool! It’s perfect for any type of citrus zest and can be used to grate hard cheese, chocolate and even fresh ginger. Handheld Citrus Juicer – I talk about this juicer in a lot of my posts. It’s so easy to use and if you buy the largest size, the one meant for oranges you can use it for limes, lemons AND oranges (at least small oranges)! As long as you wash it well after each use, it will last for quite some time. This Chipotle Chicken Burrito Bowl provides an amazing combination of flavors and an extra kick from the cilantro lime sauce for a healthy lunch or dinner! Add olive oil to a small saucepan and heat over medium-high heat. Add onions and sauté 1 minute; add garlic. Add beans, cumin, oregano and chipotle and bring to a boil then reduce heat to medium-low and simmer for 20 minutes. Keep warm. While the beans are cooking, place the rice and water in a medium saucepan and bring to a boil. Reduce heat, cover and simmer for 25-30 minutes until rice is tender and water is absorbed. Remove from heat. Add lime juice, lime zest, cilantro and rice wine. Mix well, set aside and keep warm. Mix the yogurt, salt, sugar, zest, green onion, cilantro and jalapenño in a small bowl. Refrigerate for at least 30 minutes. To assemble the bowl, divide the rice between two medium-sized bowls. Top each bowl with chicken, black beans, queso fresco, pico and avocado. Add the desired amount of Lime Cilantro Sauce. Serve immediately. Cooking time for this recipe assumes you’ve made the Spicy Mexican Chicken ahead of time. If you are making it at the same time, I’d add about 10 minutes to your total time to allow the chicken to cool before you shred it. The rice sounds amazing. This dish will totally satisfy my Mexican food craving in a healthy way. I love Mexican food too! I love how packed full of flavor this bowl is and that cilantro lime rice sounds like a perfect side dish….yum! I love Mexican food as well! I find my downfall in making it is all the “extras.” I am talking guacamole, sauces, sides, etc. Burrito bowls are so quick and easy! Love your creation! I love burrito bowls!! These look fabulous. Yum! So pretty and healthy and scrumptious looking! 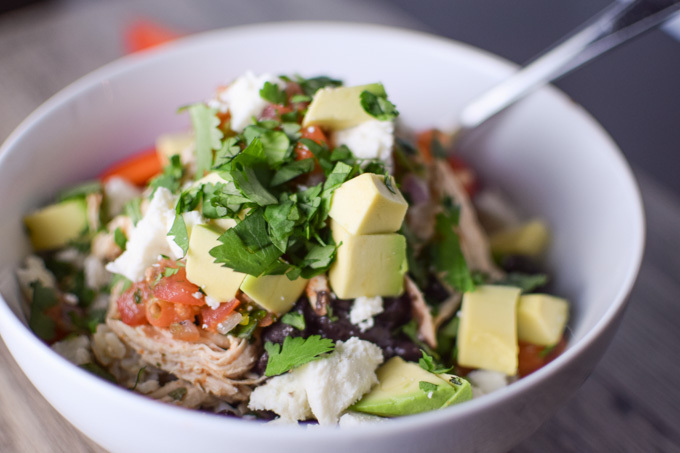 Burrito bowls made at home are SO much better than the take-out kind…pinning this one! Thanks Kate! Just checked out your blog – absolutely loving it! This looks so bright and fresh, and a really lovely way to indulge in big flavors in a healthier way. Love the sound of that yogurt-based cilantro-lime sauce! Thanks Amanda – the cilantro lime sauce is one of my favs! Ooooooh Yummy!!! After the over indulgences of Christmas this will be perfect. The flavours of that sauce just sound amazing!!!! This looks so delicious! I love all the flavors and spices and cilantro is one of my favorites in Mexican food. Yum! yes to burritos, yes to healthy bowls, yes to you for this wonderful post! This looks so fresh and yummy! Need to add more mexican food to my life! The prefect little dinner….all on one bowl. LOVE it!! Lovely and healthy! Happy New Year! Yum, this chicken burrito bowl looks amazing. I love dishes like this one. Yummy!! We love Mexican food. This looks like a great recipe to get back on track with healthy eating. Can’t wait to make this dish! This sounds fantastic! So many great flavors, and seems like such a light alternative without sacrificing taste. Gorgeous! And the cilantro lime sauce sounds divine!